Snakes are fascinating animals, and with regular handling, most of them can be quite tame as pets. However, snakes are obviously not the right pets for everyone. They have unique requirements and should only be cared for by those with the commitment and understanding to meet their needs. If you are new to pet snakes, find out what you should consider before deciding to get one and what species are the best snakes for beginners. When choosing a snake as a pet, realize you are making a long-term commitment because many species can be expected to live over 20 years. You must be willing to feed prey animals to your snake (though previously frozen, pre-killed prey is the safest choice) and you will probably have to devote some freezer space to frozen prey items (i.e., rodents). Snakes are very good escape artists, so you will need to make sure you have an escape-proof enclosure. Snakes are persistent about finding and squeezing through any small gaps. As beautiful as they are, large constricting snakes and venomous snakes are not recommended as pets due to their safety concerns. Get a captive bred snake from a reputable breeder, if at all possible. Wild caught snakes tend to be more stressed and prone to parasites and disease, as well as being more difficult to tame. You will want to do a cursory exam of your snake to check for any signs of illness, including bubbles coming out of the nose, retained skin, closed eyes, and mouth rot. Ask for a feeding demonstration to make sure your new snake is readily taking pre-killed prey and eating well. Ball pythons are somewhat notorious for having feeding problems, so this is an especially good idea for ball pythons. Feeding pre-killed prey is recommended since a live rodent can inflict some serious wounds on a snake in self-defense (plus it is more convenient to keep a supply of frozen prey in your freezer than raising or buying live animals for feeding). All snakes need to be able to regulate their body temperature by moving between cooler and warmer areas. Providing a gradient and making sure the warm side of the tank is warm enough is essential to your snake's health and ability to digest their meals. There are some fairly common signs that a snake is about to shed that might seem a bit alarming to a new snake owner. Learn what to look for before you are caught off guard. How Can I Tell if My Snake is a Male or Female? There are a few ways to determine whether you have a male or a female snake. Just in case your new snake turns out to be an escape artist this general information on finding lost pets might help you track them down (but keep in mind that a snake will most likely head for a warm, enclosed space). Read some of these cautions about larger constricting snakes and handling guidelines along with information specific to boas and pythons. 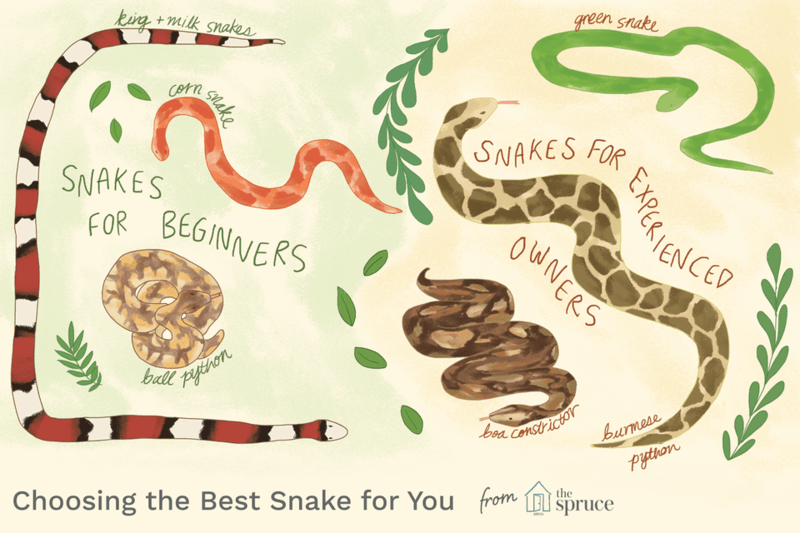 Whatever snake you chose, new owners should be familiar with the proper care, feeding, behavioral characteristics, and the commitment required to keep the snake.